Ken Roczen continued his consistent 2019 AMA Supercross season at round six in Minneapolis, notching a steady runner-up finish in U.S. Bank Stadium and reassuming a slim lead in the championship chase. The Team Honda HRC rider, who has yet to finish outside of the top five this year aboard his CRF450R, started the main event in third place and rode there for 15 laps before putting a pass on Joey Savatgy to take over second place. With the leader out of reach by that point, the German held his position to the finish. Teammate Cole Seely managed a decent start and was in the top eight for the first five laps, but when he tried to make a pass on Justin Barcia, the two collided and Seely went down. The Californian remounted around 15thand began working his way forward, eventually finishing the 20-lap race in 11th. 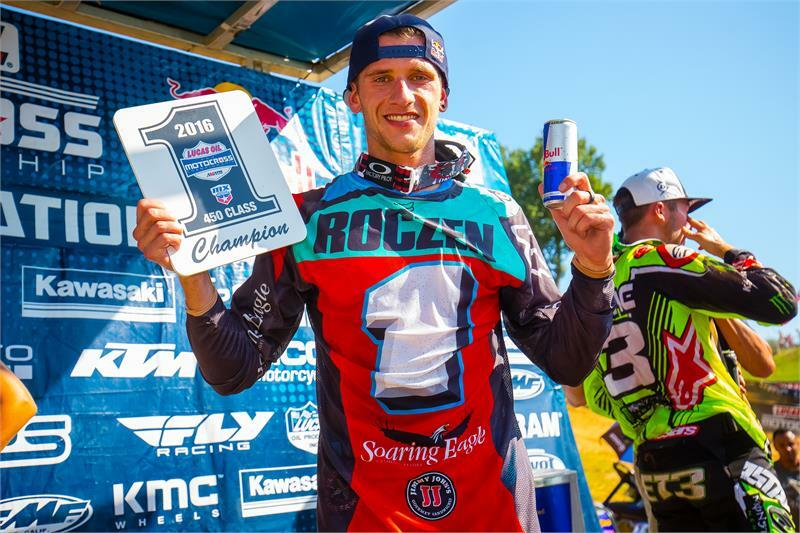 Now that the AMA Supercross series has headed east for a month and a half, Ken Roczen has relocated back to his home in Florida, while teammate Cole Seely is still based at his home in Costa Mesa, California. Periodic rain in the Golden State has made it difficult for Seely to maintain a regular practice schedule, and the trend is expected to continue this week. “At the end of the month, I’m moving to Florida too, but until then we’ll just do our best to deal with the weather,” Seely said. Though the weather was more cooperative in Florida, Roczen’s practice schedule was also disrupted, as he spent much of the week letting his skin recover from the rash caused by lime that organizers had put in the wet dirt at last week’s San Diego Supercross. Roczen only got in one day of practice but hopes to be back to his regular schedule this week. When he’s not training or practicing, Seely has been keeping busy lately with a bike-build project on his new Honda CRF450L dual-sport machine. He and friend Mike Ojeda of Bleach Design Werks recently completed the teardown stage, and Seely has been uploading vlogs to his YouTube page, though he’s keeping his cards close to his chest when it comes to revealing his plans for the build itself. Minnesota was the first round of the season where the pits weren’t in the parking lot, but instead were inside, out of the cold. “The trucks were out in the snow, so we had to unload all of our essentials and bring them down to our makeshift pit area in the tunnel,” Kehoe explained. “It took everyone out of their routine, but we adapted.” The Team Honda HRC mechanics used warmers on the tires and suspension to keep the bikes working consistently. Lap times during the daytime qualifying-practice sessions were extremely cloe, with the top 12 riders within just over a second. MotoConcepts Honda’s Vince Friese was the top Red Rider, posting a 47.168” time that proved to be sixth-fastest. Teammate Justin Brayton was next at 47.307”, with Roczen eighth at 47.412”. Seely posted a 47.679” lap that was the 11th-quickest time. Despite a sore thumb, Brayton scored an impressive win in the second heat race aboard his CRF450R after leading almost the entire race. Meanwhile Seely was sixth in that race, whereas Roczen had finished third in the previous heat. This coming Saturday, Team Honda HRC will be in action at round seven of the AMA Supercross series at AT&T Stadium in Arlington, Texas.